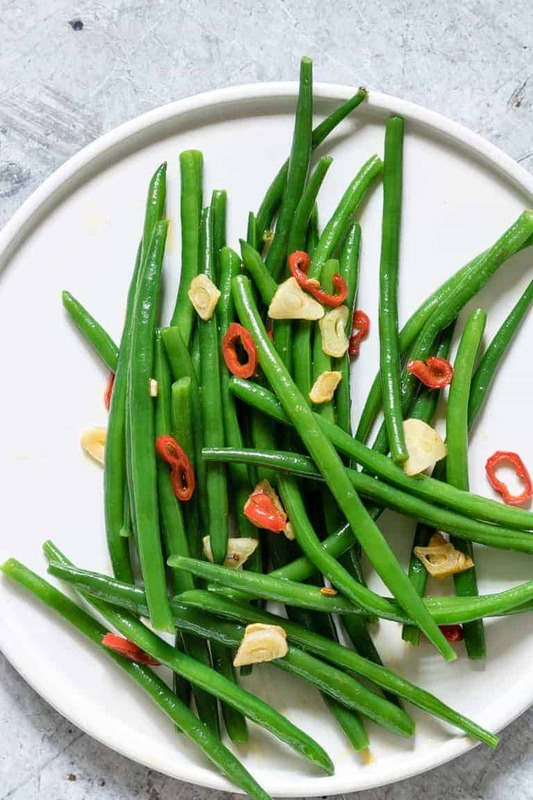 You only need 5 ingredients to whip up this tasty Chili Garlic Green Bean Recipe that makes a great side to any lunch or supper menu. It is suitable for gluten-free, vegan, Paleo and Whole 30 diets. Post includes Weight Watchers points. 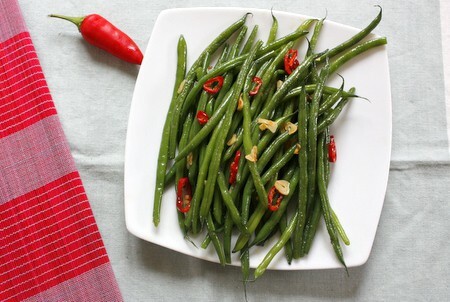 Let’s whip up an easy, fast, tasty, made-from-scratch Green Bean Recipe. 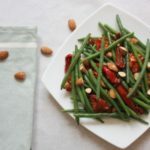 And to spice things up a little bit we are going to add some crunchy fried chilli and garlic to a turn this into an over the top delicious Chili Garlic Green Bean Recipe. Yes, we will turn 5 simple ingredients into one perfect gluten-free and vegan side dish in less than 10 mins. So gather all your ingredients and let’s get cooking…. Guys let me show you How To Cook Green Beans. It is really, really easy. Step 1. Select the best beans and discard any that don’t look fresh. Step 2. Then rinse and top and tail them. Step 3. 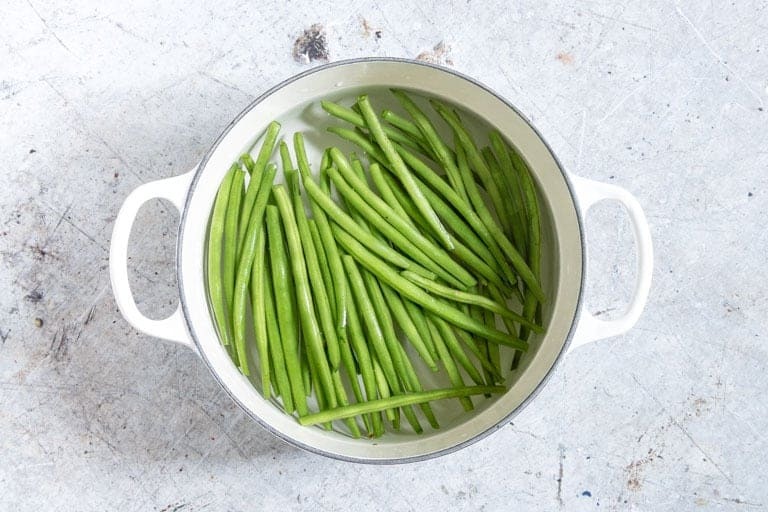 Bring a pot of salted water pot of water to the boil, add in the green beans and cook 3-4 mins until they are tender but have a little bite. Step 4. Drain the water and plunge the beans into some cold water and drain again before seasoning and serving. Chef’s Tip – Ice cold water is best as this cools the beans quickest and keeps them from cooking further as they cool down. 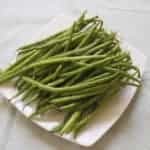 Now that you know how to Cook Green Beans, let’s set these aside and do the next stage. Step 1. Heat the oil and add the garlic and chillies and season with salt and fry stirring frequently until the garlic becomes crunchy and just starts changing colour. Step 2. Take off the heat immediately and pour into a cool container. Step 3. 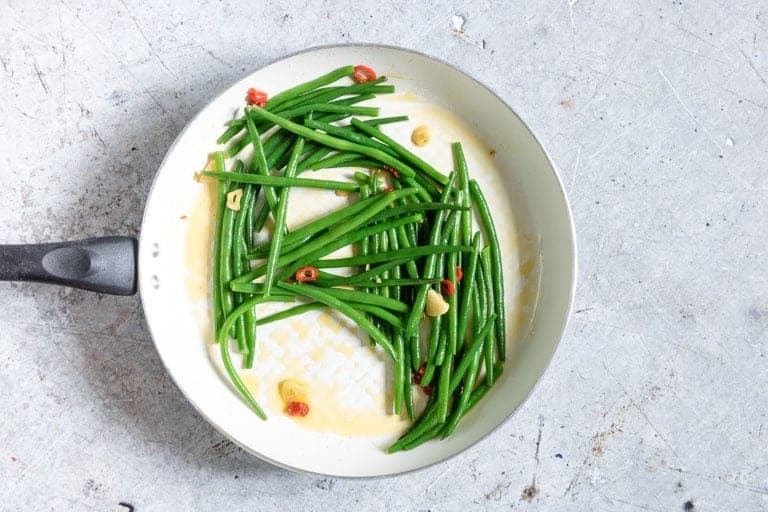 In the same frying pan quickly stir-fry beans for a min. Step 4. 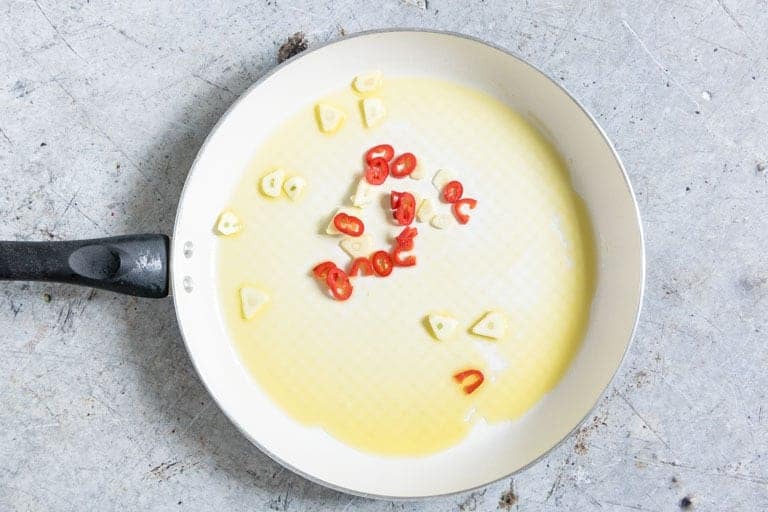 Return the all the garlic and chilli and half the seasoned oil to the pan and mix. Chef’s Tip – If you pour all the oil on the beans it might be too much so if you want to add a bit more then mix in an extra 1/2 tbsp of oil at a time. Chef’s Tip – Fried chillies and garlic make such a good vegetable topping combo. It is great with of pretty much any vegetables including Broccoli, Roasted Carrots, Instant Pot Sweet Potato and Roasted Okra. Feel free to experiment away. 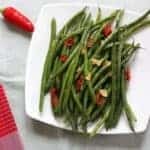 This Garlic Chili Green Bean Recipe is so easy that you will come back to it again and again and again. Leftovers are great chucked into a salad or omelette. Simply preheat the oven to 2ooc / 4oof / gas 6. Add the beans to a lined baking tray, drizzle some oil and some salt, mix well and bake for about 20 mins. Cooking green beans with bacon is easy. Simply follow the How To Cook Geen Beans section above, then cook your bacon till done before adding in the chill and garlic for a further min or so. Then add in your green beans and you are good to go. 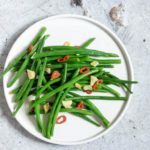 This Chilli Green Beans recipe calls for fresh beans but you can easily use canned green beans if that is what you have to hand. Simply drain the beans, put them in a saucepan and cover with water. Heat until warmed through or cook for a further few mins if you prefer softer beans. Then continue with making the chilli garlic oil. If you use olive oil as the vegetable oil, there are 6 Weight Watchers Freestyle per serving. 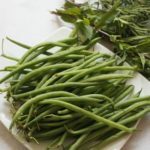 I hope you enjoy this third Green Bean Recipe in the pantry staple spotlight on green beans recipes (aka french beans or string beans). 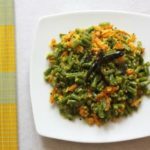 Find other green bean recipes below. Thank you for reading my chilli garlic green bean recipe post. And please come visit again as I continue dreaming up recipes, traditional African recipes, African fusion recipes, Sierra Leone recipes, travel plans and much more for you. Post originally published August 2013. 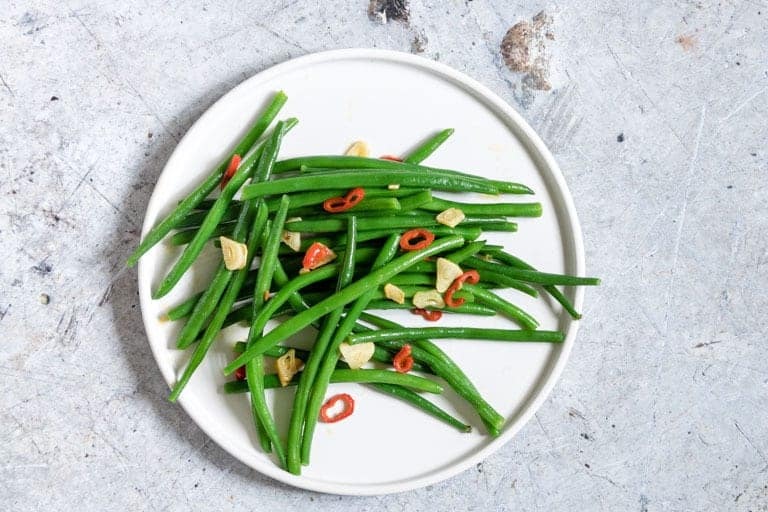 Don't forget to tag #recipesfromapantry on Instagram or Twitter if you try Chilli and Garlic Green Beans! It is really, really awesome for me when you make one of my recipes and I'd love to see it. You can also share it on my Facebook page. Please pin this recipe to Pinterest too! Thank you for reading Recipes from a Pantry. Ohhhh. I love the idea of sprinkling on the breadcrumbs. Love the vibrant reds and greens in your picture! Anything with chilli and garlic gets my vote. I should introduce you to the OH. How delicious! I have never thought to fry garlic, but it sounds wonderful! I bet the fried garlic and chilies go perfectly with green beans. Yum! Hey Tammy, I really do love your photography. Thanks for stopping by Lisa. I am going to go check out your blog now. 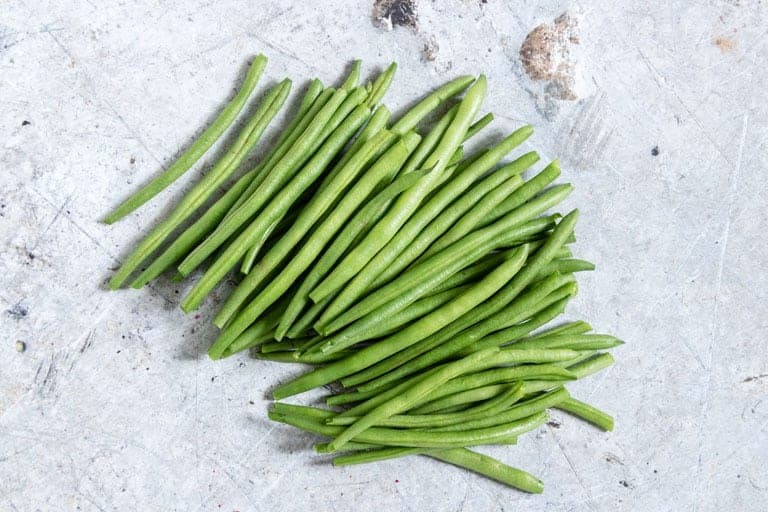 I just bought some green and purple string beans from my local farm stand and this looks like a perfect way to cook them! I love the purple beans. Infact that is the variety we use most. I am soooooo gonna try that combo on the next lot of beans I make. 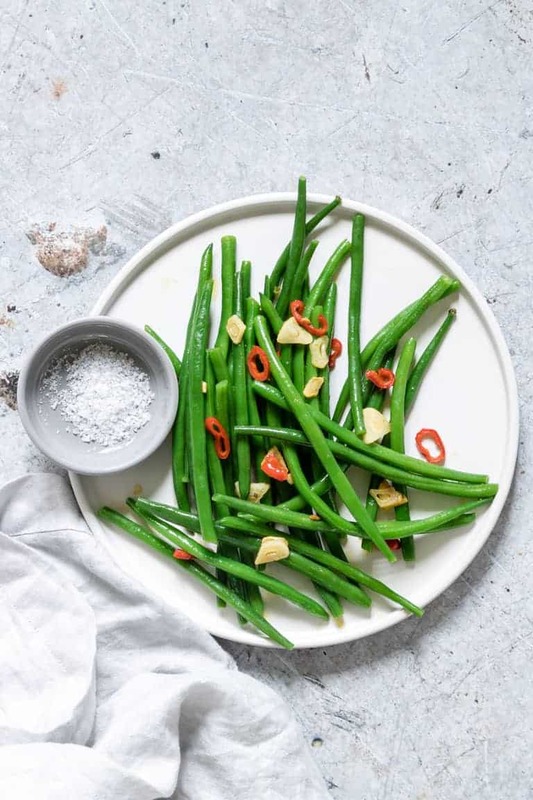 When I met my husband he loathed green beans – but it was because he had only ever had canned ones before. I gotta try this variation for him, he would just love these. Already pinned these to try soon. 🙂 Thanks for sharing at #GetHimFed Fridays, hope you have a nice week! Thank you Jess – I do enjoy hanging out at get him fed. Oh yum! 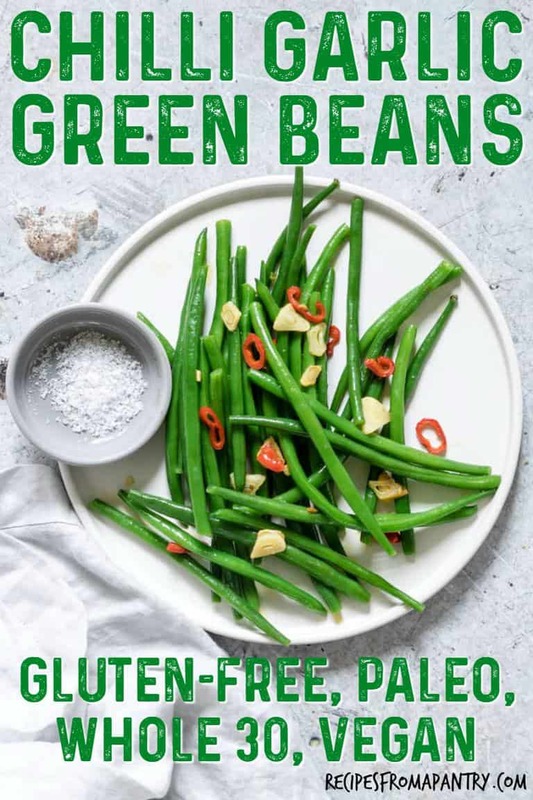 I don’t often cook greeen beans (except in curries) as I find them just a bit dull, but this would totally get my vote, (in fact anything with chilli and garlic gets my vote!). Yum. This sounds like such an awesome side dish! Adding chili and garlic to green beans would be so good! This side dish is perfect for dinner tonight! Love the flavors! I love simple side dishes like this they are great with everything, especially roast chicken! I only recently developed a taste for peppers and now I love them – this recipe sounds so good!! I really love healthy and delicious recipes. This one reminds me of the way I cook fresh asparagus. The process is very similar! I’ve just never dunked them in cold water before. Have you tried cooking asparagus with this method? I love how simple this recipe is but still packed with lovely flavours.